Mario Fontanella (left) joined Valletta from Floriana prior to this season. 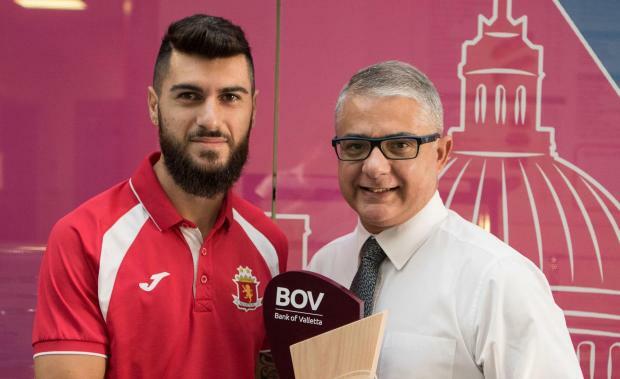 Valletta’s Mario Fontanella is the BOV Player of the Month for October 2018. The Italian striker, who joined Valletta from neighbours Floriana during the summer transfer market, stormed to the top of the Premier League scorers list with 10 goals, five of which scored in Valletta’s three big wins against Balzan, Pieta' Hotspurs and Mosta during the month of October. His second goal against Balzan, a diagonal shot after following an exchange with Bojan Kaljevic, hit the foot of the upright past a helpless Sultana, got him voted as BOV Player of the Match.